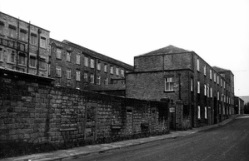 The town of Stalybridge was the creation of the Industrial Revolution. In 1776 came the event that was to lead to the development of Stalybridge as a town - COTTON! Cotton manufacture in the village was growing rapidly, and more water-powered mills were being built along the local steams as well as along the river. The image above is of Copley Mill (circa. 1871) which is a listed building. It now houses office space and storage. 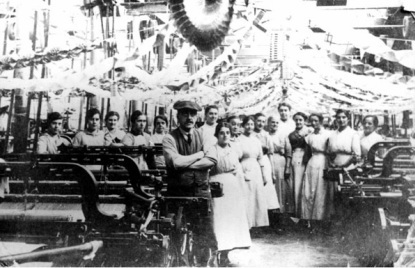 Ladies of Stalybridge at work in the Cotton mill. 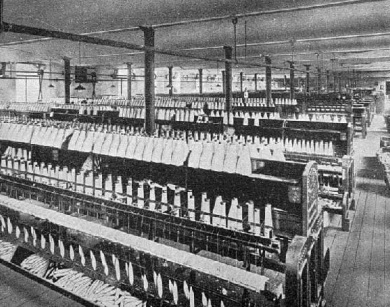 In 1776 Neddy Hall built the first cotton mill in Lancashire. It stood in Wood Street, Stalybridge, near the Bus Station. At that time Ashton-Under-Lyne extended as far as the River Tame. Then he used the carding process, it was water-powered and the spinning was done by hand. In 1798, Hall made history again when he put the first steam engine into his mill. He was the first to use steam power in a Lancashire mill. Neddy Hall is buried at the top of the churchyard, beside the foundations of the old St. Georges church (this has long since been demolished) - Access to the graveyard is via the 'Bohemia' cottages. Five years later, Messrs. Lees, Cheetham and Co. put a much larger engine into their mill, namely Cheetham's Mill - by the side of Cheethams Park - and the Industrial Revolution really got underway. The newly built local canals - the Huddersfield, Ashton and Peak Forest - and the new turnpike road to Huddersfield provided transport facilities, and nearby coal mines ensured power supplies. Please click here to return to the top of the page.